So this review is nothing too detailed, but is one of my longer review yet. I’ve been carrying this book around and trying to get the time to just sit down and make the review on this; this book has pretty much been everywhere wherever my bag has been during this entire summer. Wishbone books are novelizations of an old TV show that used to be aired by the same name (you can find a few episodes on Youtube, I hear). In essence it was a Jack Russell terrier called Wishbone that had a personality, living with his owner Joe (a fourteen-year-old kid) and often got wrapped up in happenings with Joe’s two friends, Samantha (Sam) and David, who are of similar age range. Most of the time some real-life thing would occur such as a mean principal, missing items or friend problems. While this happens, Wishbone would draw some parallel between a popular written work, such as Sherlock Holmes, Robin Hood or some other literary tale. Both stories would be told at the same time as Wishbone would insert himself as the main character of said literary work, adding an interesting dynamic to the already iconic tale. This proved to be extremely educational, fun and interesting all at the same time. The TV series was excellent and there were many more books published beyond retelling of the TV show. The entire tone was trying to encourage kids to read, which I think was successful to a degree. I used to borrow these books all the time from the Greeneville library, as they had most of the collection back in the day. I’ve probably read about a dozen books in that period, perhaps more. Eventually I stopped paying mind to them as I grew up. Recently I remembered my favorite book out of the series, “Unleashed in Space”, and the book it was based off of, “Legion of Space”. I had never read or was able to get ahold of the latter, so while I visited Amazon to grab a copy to read, I decided to get its Wishbone counterpart and do a small review on it. So, here we are! Do bear with me a little as since the book has two storylines going on, there will be a blurb on each. I’ll try to shorten the actual literary work so its not predominant (and I do plan to do a review on The Legion of Space at a later date) and focus on the Wishbone portion of the book. Our story starts out in that Joe, Sam and David are heading to Space Camp. The camp had a special contest in to write an essay to why their dog should attend the place, the winner allowing the dog and their owner to attend for six days free. Joe and Wishbone have won this competition, and after a lot of odd jobs with his two friends, Sam and David get to tag along too. The story plods along as the kids do various space tasks and get involved with late 90’s space technology, mostly related to the Space Shuttle. They get to a point in which they are assigned roles for a mock mission; Joe picks flight commander, David payload specialist and Sam mission specialist. Wishbone gets picked as the mission’s mascot and has his image plastered on the patch. However, this doesn’t go to plan. The camp counselors rearrange everyone into roles they don’t want or seem fit to do, baffled as they start training. Joe is put to do science stuff, which is hard and unlikeable for him. Sam is put to do the piloting command position, which is hard for her as well. David is put to do mission specialist and has to do spacewalk stuff, conflicting with his fear of heights. The three kids battle all sorts of challenges until they finally get enough courage and smarts to pass the final test, a full simulated mission. Wishbone is bestowed a medal for being a good mascot and representing dogs in space (referencing Laika and such). 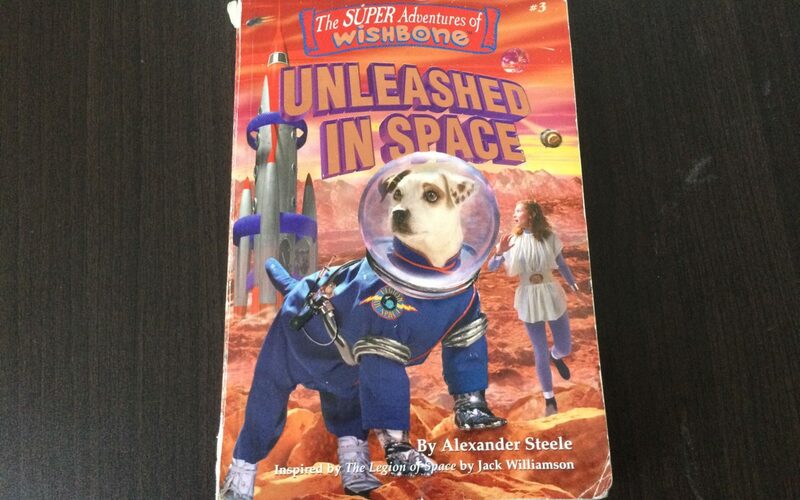 In the parallel story, Wishbone starts imagining himself as John Ulnar, a graduate of the Legion of Space Academy. A descendant of the Ulnars, the rich influential family that did space exploration, then ruled the Solar system as the Purple Empire as a dictatorship, then suffered a rebellion in which the “Green Government” established a democracy (Really parallel to Gundam and some other anime sci-fi’s re-reading it, extremely uncanny). So as such while he has notability for the space exploration and achievements, he carries the “traitor” mark for having been part of the family that oppressed the Solar System. To cut that down to a manageable size, John (or Wishbone) is tasked to protect a woman by the name of Aldoree, who knows how to make AKKA, a weapon that’s extremely powerful and can protect mankind. John is assigned by another Ulnar (who commands the Legion of Space) to protect this woman. She gets kidnapped by some alien jellyfish called Meduas and yet another Ulnar, who’s a nephew of head honcho Ulnar. The entire thing turns out to be an elaborate coup in which head Ulnar is trying to resurrect the old Empire, trying to get rid of the AKKA person from the Green Government so that the Medusas can flatten everything for his taking. As it turns out, the Medusas have their own plans, which involve taking the solar system for their own. John ends up single-handedly battling for humanity with a few companions, saving Aldoree and succeeding in deploying AKKA to fight the Medusas and save the solar system from invasion. I related to these books a lot as the kids were my age at the time; I probably was reading them about 2000-2001 and I was about 13. From a simple homeschooled life I was quite enthralled at how these kids had friends, going on outings and able to get mixed up in mysteries and adventures; things I had no opportunity or permission to do. This is one of the few series I hold in high regard, having given me a glimpse of how people lived an outgoing lifestyle back then. The entire series as a whole is something I would definitely recommend for reading, despite being 15 years old. There was another Wishbone series in addition to the split-story ones that were solely mystery stories, these were a treat as well. The artwork is a bit rough but has a nice relatable sketch 90’s style that I can associate with most of the kids books from the era. As this book is no longer in print, you’ll have to scrounge it up off eBay, Amazon or wherever used books may be sold. It appears that everything related to this company and its creators have gone the way of the dinosaur, so there’s no hope or possibility of an eBook release anytime in the future. (This was the case for the TV show as well, only certain episodes were put on DVD while the majority were never aired).